Having been "lost" once while trying to get to Octave Electronics in Petaling Jaya, Malaysia, I decided to make sure before taking the cab to the "Adelphi equivalent" of Malaysia. (I later discovered that it is still not quite the "equivalent" having only 8-9 hifi shops there, but nevertheless, it was interesting to find out what was available in our neighbouring country.) So I confirmed the address with Michael from Octave before embarking on my hifi adventure. The speakers uses drivers from the famous speaker manufacterer Scanspeak, which has become a common buzzword when it comes to speaker drivers (They are used in Wilson Audio, Sonus Faber, Spendor, Norh, ProAc speakers, and the list goes on ...). There is no denying that Scanspeak manufactures great drivers, though they also take equally good speaker designers to use them at their full potential. Even their top Revelator tweeter can sound hard and "un-musical" in the hands of an amateur. But don't get me wrong, I do not imply that there is such a problem. I cannot comment since I DIDN'T AUDITION the setup, as I did not have my trusty "test CDs" with me (Don't blame me, I didn't plan on doing any serious auditioning : ). The unique-ness of the CD player lies in its power supply - it is battery powered. Yet it is able to retain the convenience associated with a regular AC powered component, that is to say, "plug and play". When asked whether they had any battery powered amplifiers, Albert told me they had a power amp in the adjacent room powering their Avance speakers. Ooooh.... do you see the nice setup above? 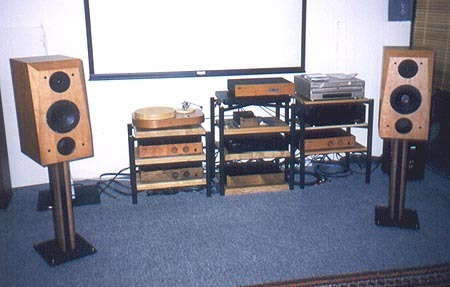 Here you can see the wooden finish Holfi amplifers and CD player. The turntables (shown below) used in this setup is from J.C Verdier (www.jcverdier.com). One Sorhlid (solid) turntable... yup, that's about the only thing I can comment about, being a turntable illiterate myself (It also uses magnetic fields in its operation). 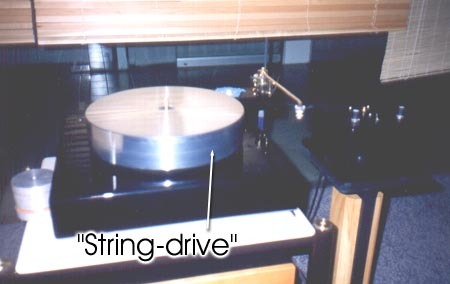 The other interesting thing to note is that this turntable is "string-driven" with the driving motor sitting on a separate stand... Talk about isolation from vibrations! I almost could not contain myself (i.e. the saliva from drooling out of my mouth) when I saw this speaker. Extremely masculine (MY kind of speaker) and using Scanspeak drivers (again... : ), this is the "top-of-the-line" Avance Century speaker. In front of the drivers, I spotted some additional contraptions... probably to further smooth driver responses and improve diffraction? The woofers looks similar in cone material to the famous carbon-fibre paper woofer used in Sonus Faber Electa Amators and Wilson Audio WATTs. 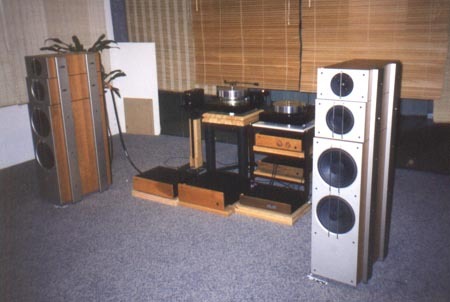 A reputedly "open-sounding" woofer. A less-than-conventional design will be the use of a "resistive vent" behind the mid-bass driver (I first came across such a design in Dynaudio speakers and their variovents - "resistive vent which damps aperiodically oscillations of woofer cones after a strong pulse". They claimed a clearer and more well-defined bass response). The room itself was mostly untreated, with only some treatment in the corners and blinds to diffuse the sound. I did not hear the setup, but I hope the parallel glass walls don't pose much of an acoustic problem. Wisma will be at the AV Fest, August 2000 as well, holding demos both at the Fest, and for more serious auditioning, in their showroom here where I visited (AV Fest would be held in The Crown Princess Hotel, which is where Wisma's showroom is located too).